To enable the Kayapo indigenous people to continue to protect 11-million hectares of their lands from deforestation, and to build the capacity of Kayapo NGOs to manage surveillance/protection and sustainable economic activities. Kayapo lands are in a region of rapid deforestation — an agricultural frontier with increasing road access and minimal law enforcement. Kayapo have fiercely protected their vast territory but face increased pressure from illegal incursions for gold-mining, logging, commercial fishing, ranching and other agriculture. 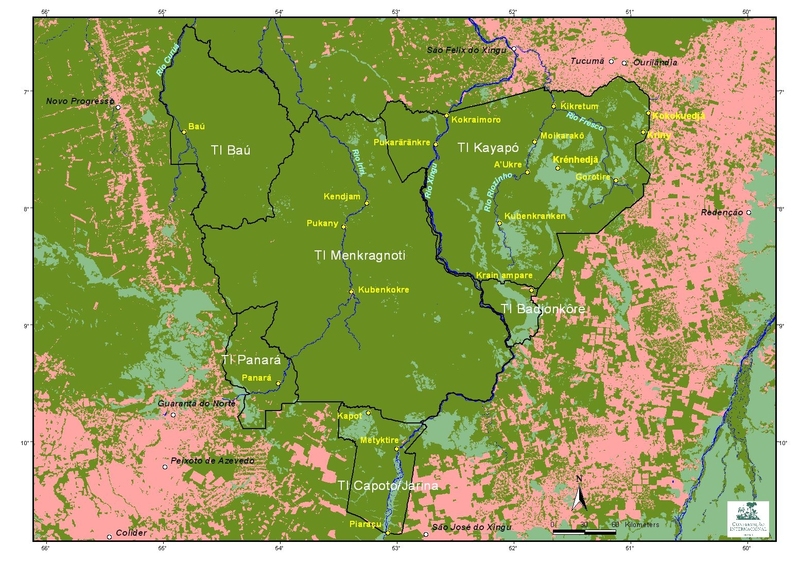 Provisioning, organizing and other assistance has enabled greatly increased surveillance and boundary demarcation.While surveillance and protection need further enhancement, our efforts have undoubtedly prevented widespread invasions of Kayapo lands. In just a few years, Kayapo NGOs have developed the capacity for managing complex programs. Local capacity for long-term management and protection has developed well and will continue to evolve. 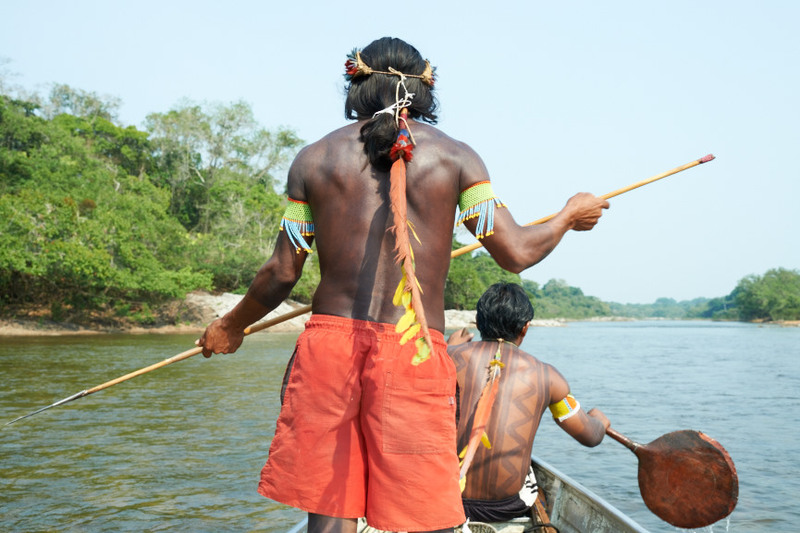 The Kayapo have gained much greater insight into the threats they face and how to meet them. The Xingu River, a major tributary of the Amazon in Brazil, begins in the semi-deciduous forests and woodland-savannas of Mato Grosso state and flows north for 2,700 km across varying topography before ending in the wet forests of the Amazon near Belem. The Xingu spans major tropical biomes from savanna (cerrado) in the headwaters of the south to semi-deciduous and evergreen wet canopy forests of the southern, mid- and northern regions. More than 20 linguistically differentiated indigenous cultures that hold millennia's worth of ecological knowledge are found in the forests of the Xingu. During the last four decades, the Xingu has been subject to increasingly intense deforestation as the agricultural frontier inexorably expands north and west. An "arc of fire" constituting the highest rate of deforestation in Brazil and indeed, one of the highest in the world, sweeps across the region. This process of colonization and agricultural expansion, often accompanied by violent land conflict in the lawless frontier, follows road construction, especially the perimetral framework of national highways. With adequate roads and suitable soils, the Xingu has become an important centre for cattle production (occupying the greatest tracts of land and by far the greatest driver of deforestation), logging (almost all illegal) and production of soy bean for export. Dozens of towns have sprung up along roads to support frontier activities and hundreds of thousands of people depend on the frontier economy. Figure 2. 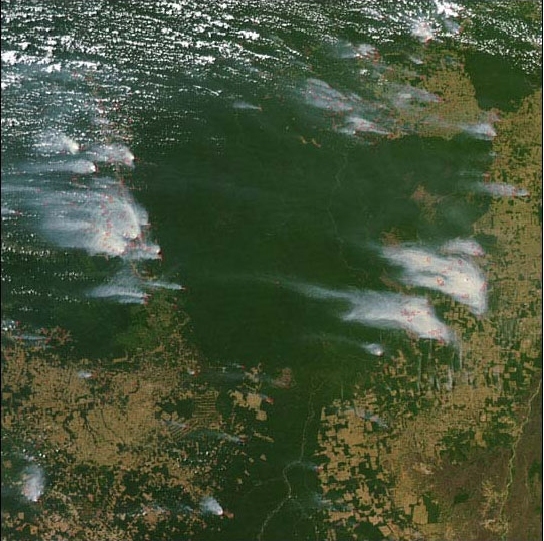 Satellite image of Kayapó lands and most of the Xingu Indigenous Park (to the south) showing plumes of smoke rising from burning of primary forest remnants outside of the Indigenous Territories. Dark green areas are indigenous lands and light brown areas are ranch and agricultural land. However, outside pressure on Kayapó lands continues to increase. If borders are not well monitored in this lawless region of weak governance: ranching, fraudulent land speculation, commercial fishing, logging and gold-mining inevitably invade and encroach into protected areas. If they cannot gain clandestine entry, loggers and goldminers will attempt to buy off individual Kayapó to obtain access to the rich timber stocks and gold on their lands. Sometimes they are successful. Once a door is opened, it is hard for even the Kayapó to control an influx. When they lack information and sustainable economic alternatives, indigenous peoples are vulnerable to outside pressure to liquidate their resources. Large infrastructure projects are an increasing threat to the region's remaining forest: i.e., Kayapó land. The mining company Vale S/A operates a nickel mine near Tucuma. The mine has catalyzed immigration to the region, increasing outside pressure on neighbouring Kayapó lands. At the same time, the third largest hydro dam in the world, "Belo Monte" is under construction on the Xingu river some 600km upriver from Kayapó lands in Para. To operate efficiently during the dry season, the turbines at Belo Monte will need water released from upriver holding dams -projected for building in Kayapó lands. In the west, the newly paved BR 163 highway from Cuiaba in the south to Santarem in the north has dramatically increased immigration into the region with associated pressure for illegal predatory resource extraction (logging, goldmining) and ranching on western Kayapó lands. Strengthening the capacity of Kayapó institutions to protect their boundaries, and develop sustainable income alternatives becomes even more crucial in the face of approaching large-scale industry. Kayapo lands conserve the last remaining large, intact block of native forest in the southeastern Amazon, and maintain the connectivity of this ecoregion with the western Amazon. They confer incalculable benefits to protection of biodiversity, mitigation of climate change and preservation of the crucial role of Amazonian forests in producing rainfall over a much larger geographic scale. Kayapo territories are large enough to protect large scale ecological processes. For example, very large areas are required to maintain tropical tree species because individuals of species are usually very sparsely distributed. Most tropical tree species depend on co-evolved animal vectors for pollination and seed dispersal across large inter-individual distances - small areas do not contain enough individuals or viable animal vector populations for regeneration over the long term. The intricate web of interdependence among Amazonian species requires large areas for these ecosystems to function and persist. Kayapo lands remain reasonably undisturbed. Large-bodied game species (including large cracids, lowland tapir, and white-lipped peccary), which are preferred by local peoples throughout the Amazon, are abundant within the hunting range of Kayapo communities. Protected lands in the region safeguard a full complement of disturbance-sensitive wildlife along with an entire vegetation transition from open savanna (cerrado) to close-canopy forests, along with endangered and threatened species (Table 1). Table 1: Threatened vertebrate species found in the Xingu protected areas corridor, with IUCN Red List (2016) designation. Kayapó lands and the contiguous Xingu Indigenous Park to the south protect more than four hundred kilometers of the Xingu river from degradation by deforestation, pollution and over-fishing. Preliminary surveys indicate that as many as 1,500 fish species inhabit the Xingu River. Fish are the most important source of protein for local people of the Xingu. Sixteen species of fish are considered endemic to (i.e. only found in) the Xingu. Our local partners are three Brazilian non-governmental organizations: the Associação Floresta Protegida (AFP), Instituto Kabu (IK), and Instituto Raoni (IR) that together represent almost all of 50 Kayapó communities with a total population of about 8,000 people. AFP, IK and IR are pillars of organization for the Kayapó, enabling them to implement programs of conservation and development that strengthen their capacity for territorial control and protection. AFP is based in Tucuma, Para state, and represents communities located east of the Xingu River. IK is based in Novo Progresso, Para, and represents communities located to the north and west of Xingu River. IR, based in Colider, Mato Grosso state, represents communities of the southeast (map of Kayapó territories with names of communities). The Kayapó organizations also collaborate with the Brazilian government Indian agency (FUNAI) responsible for upholding indigenous rights. Within Brazil, Conservation International and the Brazilian Amazon Fund (Fundo Amazonia) have established a US$6 million trust fund, the Fundo Kayapó. This fund makes annual grants to the three Kayapó NGO's in support of their conservation and development goals. Internationally, we partner on certain sub-programs of the Kayapó project with US-based Environmental Defense Fund. Finally, the Kayapó NGO's themselves raise significant program funding from domestic sources; especially from government mandated environmental compensation packages associated with road building, mining and the hydro-electric industries. Therefore, ICFC support of high level functioning of Kayapó NGO administrations leverages significant program support from other sources. Territorial surveillance: ICFC and our US based partner EDF provide surveillance infrastructure to Kayapó NGOs including boats, outboard engines, radios, 4X4 vehicles, expedition supplies, fuel, equipment maintenance and also capacity building workshops. We enable Kayapó NGOs to perform overflight surveillance and ground patrols with the result that several foci of illegal activity have been identified over the years: goldmining, logging and encroachment by ranchers. Pressure on Kayapó lands continues to intensify as immigration to the region builds along expanding road networks. Surveillance was scaled up in recent years in response to a higher incidence of invasion by goldminers and loggers are never far behind. Illegal logging is driven by high prices for export grade timber. Instituto Kabu negotiation with FUNAI for highway impact compensation package. No longer are the traditional warrior tactics of their Kayapó forefathers sufficient for protecting indigenous rights in the 21st century. The Kayapó must learn to protect their interests and rights in the legal context of outside society. Their three NGOs play a central role in their future, hence the value of ICFC's support for management and administration of Kayapó organizations. High functioning administrations have become adept at program development, program implementation and financial accounting, so much so that Kayapó NGOs have been able to obtain the lion's share of program funding on their own. An important source of program funding accessed by Kayapó NGOs is government mandated environmental compensation packages for infrastructure and industrial development. The AFP Kayapó of the northeast completed their first year of a multi-year deal with the Vale Mining company to compensate for impacts of the nearby "Onça-Puma" nickel mine. Vale funding will mitigate mine impacts by supporting the AFP's surveillance and sustainable economic development programs, as well as initiatives to strengthen Kayapó cultural identity. After successful completion of the first five year contract, the northwestern IK Kayapó were able to renew their compensation from the Department of Transportation for impacts of paving the Cuiaba to Santarem BR-163 federal highway. Paving of this highway opened the floodgates to colonization and deforestation along the western border protected by IK and this compensation is playing a crucial role in helping the Kayapó to continue to defend their lands in the west. The IR representing the southwestern Kayapo is working to obtain a compensation package for paving of a highway in Mato Grosso that will increase pressure on their lands. Negotiation of these significant grants for conservation and development counts on professional level administration performed by the Kayapó NGOs. Every year, ICFC supports meetings of Kayapó leaders in the Annual General Assemblies of their organizations. At the AGMs, Kayapó leaders review the past year's work and accounts and approve work-plans and budgets for the upcoming year. Notably, in 2014 we supported all Kayapó leaders from across Kayapó lands to meet in Kokraimoro village on the Xingu river. At Kokraimoro, in a traditional forum Kayapó leaders had the opportunity to renew old bonds and develop a united position on the very serious threats looming on the horizon: proposed changes to the Brazilian constitution that would allow industry on indigenous lands and the Belo Monte dam complex.